Barn Cottage sleeps four in 1 king size double, 1 twin room. Open plan lounge/diner/kitchen including wood burning stove and fully equipped kitchen with electric double oven and induction hob, washing machine, tumble drier, dishwasher, fridge freezer and microwave. Lounge has panoramic views with windows on all sides, and the Cottage has its own large private garden with a burn running through it. Bathroom has bath and separate shower cubicle with electric shower. Up to 3 dogs accepted. The barn cottage was relaxing and comfortably but the personal touches was what made the visit special. A lovely doggie hamper, fresh flowers and homemade shortbread. Thank you Anne and Mike for a lovely stay. Thank you for your review and for your positive comments. 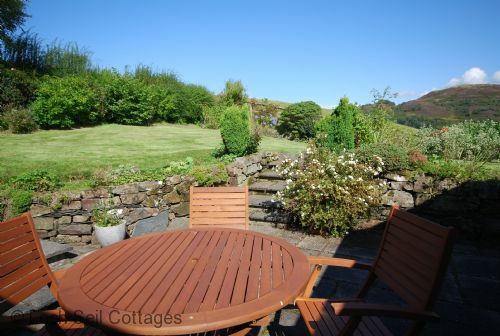 Barn Cottage is a lovely cottage with stunning views and gardens. There was a warm welcome and once in the cottage there were two welcome baskets, one for humans and one for dogs and a vase with flowers...such a lovely touch! All we had to do was unpack and enjoy a cup of tea and biscuits. The beds were so cosy and comfortable as well as the luxury towels provided for us. Anne and Mike thought of every little detail to make our stay special and we would definitely stay again! I would highly recommend Barn Cottage and can only assume that the other cottages at Loch Seil would have the same attention. Hi, thanks for taking time to review us and for your comments. We're really pleased you enjoyed your stay with us and thank you for recommending us. Just had a lovely weekend at Barn Cottage. A genuinely dogfriendly self catering establishment. The cottage is set in lovely grounds with a safe enclosed garden where your pets can enjoy a wee wander. Outdoor furniture is available for the better weather for sitting out. Inside the standard of decor and furnishings is exceptionally high. Comfy couches in the conservatory style lounge which is light and bright and looks out over the garden. The kitchen is well laid out, very well equiped and easy to keep tidy. The woodburner is a nice touch to provide cosiness in the evenings. The bed in the double room was very comfy and coupled with the peace and quiet ensures a great night's sleep.The owners are friendly and welcoming and live on the property but are respectful of guests privacy. There is plenty to see and do in the area even in winter/spring and the scenery is breathtaking. One of the best cottages we have stayed in and one we plan to book again. Thank you so much for all your lovely comments and we're so pleased you enjoyed your stay with us and hope to return. We will look forward to seeing you again. we found the barn cottage fitted our needs exactly, great views, garden big enough for our lab to wander and well maintained. gateways lead to walking over the hills as far as you want to go. the cottage is part of the owner's property with two other cottages but at no time is it a problem the owners are there if you want them but keep out of your way if you dont. no hidden costs it's what you pay before you go there's everything you need supplied.we have no criticism and the only thing i would add to the place is a steel bucket for the ashes from the log fire as they stay hot for a long time and make more that the ash pan can handle especially carrying them to the bin. thoroughly enjoyed our stay and will return without dought. Hi, thanks for taking the time for such a detailed and positive review. We're glad you enjoyed your stay with us. With regard to the steel bucket, we do have one which guests are welcome to use, but generally we have found that our cleaning out the ash at changeover is sufficient, and the wood burner in Barn Cottage is designed to burn ash to a dust so it shouldn't need emptying often. We look forward to welcoming you back again in the future. Unfortunately only had 4 nights but could’ve stayed for weeks - we didn’t want to come home. Firstly the cottage is immaculately clean, well equipped and an added bonus of a thoughtful welcome pack with milk and eggs etc for us and one for our dog Harry who loves the treats which were provided. We had the most comfortable night sleep and the cottage was always warm and cosy especially with the log burner. The land that surroundes the cottage was luckly available to Harry our cocker spaniel when we were there and this was a massive added bonus as he had miles to run! I think sometimes the farmer has livestock in them but there are many other walks on your doorstep and Anne the owner is a fountain of knowledge for good walks in the area and is happy to advise you where to go. Location of the cottage is fantastic and there is a little shop down the road for more supplies if needed but Oban was only about a 15 min drive. Would recommend a trip to the wonderful island of Easdale and lunch at the Puffer - the island is also dog friendly. A trip to Glencoe was only 1hr or so away and also worth doing too. Thank you so much for letting us stay in your cottage can’t wait to book up again for next year. Hi, thanks for taking the time to write such a detailed review, and thanks for all the positive comments. We look forward to seeing you again next year. Lovely place but not for us as you couldn't truly relax. The owners are adjoined to the property which it doesn't say in the advert. The fence is very low and we felt like we were were in a goldfish bowl! She also charged me £60 for my 3 dogs for 3 nights which is extortion. We had 3 nights in total it cost £405 my 2 of my dogs are only small i left no mess. The owners actually wanted us to put dog poo in a plastic bin with no bag that was at the other side of the cottage! The views aren't as advertised neither, you can't see as much as it shows in the advert. It is clean but I dare not use anything I felt like Elizabeth from Mrs Bucket. Also it was raining when we went and the roof was leaking! It's a good job we didn't leave anything valuable on the coffee table while we were out. Thank you for taking time to review us, we always value feedback. We were sorry to learn that you felt Barn Cottage was not for you. 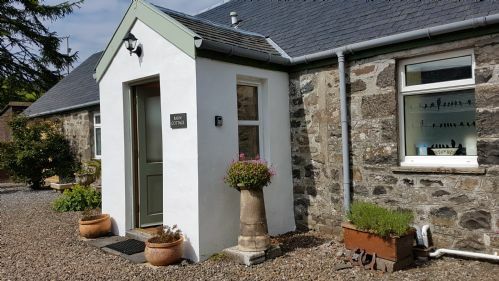 When you phoned to book, I advised you that the cottage was not available as it was closed pending roof repairs and, although we do not normally take 3 dogs in our other cottages, I offered you Seil Cottage as 2 of your dogs are small. You specifically requested Barn Cottage for the lounge conservatory area, so, as the roof was not leaking at that time, I undertook to contact the roofers. They deferred their work from Monday for you, and you were well aware of this before making the booking. Since there was then torrential rain on the 2 days you were here, it is not surprising that there was a further drip, but you did not tell us. We value our guests’ privacy and the cottage is not overlooked. The cottage adjoins our laundry/store room used for servicing the cottages – this is not our living space. The fence is traditional local post and rail fencing and is clearly visible on the images of Barn Cottage, as are the views with images taken from both the garden and inside the cottage. The dog waste bin is for bagged dog waste only and is a standard black dustbin with a black bin liner. Under no circumstances would we want anyone to deposit dog poo into our bin without a bag. The bin is located with the other refuse bins. The charge of £20 per dog is standard practice and is not size or duration dependent. We pride ourselves on the regular 5* rating we get for cleanliness and the standard of cleanliness is normally appreciated by our guests. We’re sorry that our offering was, as you say, “not for you”, but we wish you well in any future holidays. Thanks for your review, and for taking the time to comment. It was great having you here, hope to see you again sometime. We had a fantastic time at Barn Cottage, it’s so comfortable, well equipped and peaceful and is also dog friendly! This was important to us as the reason for our stay was to enjoy a walking holiday on the dramatic west coast so the location is also ideal. 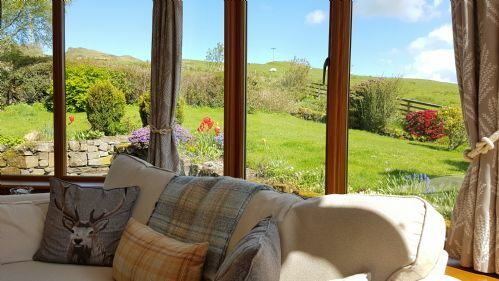 Mike and Anne are the perfect holiday let owners and obviously have years of experience, they have literally thought of everything and are extremely friendly and helpful. We definitely recommend Barn Cottage and wish Mike & Anne all the best. Hi, thanks for the great comments and good wishes, it was lovely to have you here, and we hope to see you again. Thanks for the great review, we're glad you and the dogs had such a great holiday with us. Look forward to seeing you again. Hi, thank you for reviewing us and for such positive comments. We're glad you enjoyed your stay and hope you may be back sometime. After a 5.5 hr journey, it was lovely to arrive at Barn Cottage and find such a warm welcome. Not only was there a basket of treats and a pint of milk in the fridge waiting for us, but there was even a basket for our 2 dogs, with blankets, bowls, treats and poo bags in. It was so thoughtful, I wish every cottage we’d stayed in was the same. Beds and sofas were very comfortable, kitchen better equipped than my own, and the dogs loved the large, well-fenced garden. The log burner was very easy to use, as were the washing machine and tumble dryer. The cottage is in a lovely location, over-looking Loch Seil, with walks from the door. We didn’t walk across the fields to Barnacarry Bay as there were cows in one of the fields, but we did the forest walk, with tremendous views, and enjoyed exploring the nearby Isle of Seil. Very handy for Oban, and yet also a peaceful, tranquil setting. Hi, thanks so much for your lovely review comments. We're really pleased you all enjoyed your visit and the surrounding area, and it would be great to see you back again! Thank you for reviewing us. We're glad you enjoyed your stay with us and hope we might see you back. This is a beautiful cottage in a most pleasant area away from the noise and worries. Anne and Mike are lovely people and make you welcome. The Cottage is very well equipped and the renovations are excellent. We would recommend this Cottage because of its wonderful location. We all felt so very relaxed. Thank you for taking time to review us and giving us such positive comments. Hope to see you again. We have been visiting Duachy and their three cottages, Rowan, Seil and Barn for about 20 years until the previous owners moved out. Having seen that the cottages have new owners and were once again taking bookings, we thought we would try them out. We were a bit apprehensive, having had so many good holidays in the past. Would our expectations be met? It is fair to say that our expectations were exceeded in every respect. The location is as good as ever, with wide views of open countryside. 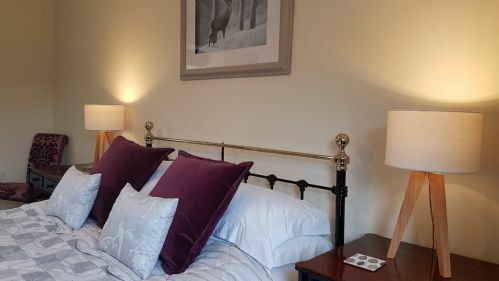 The cottages have all been upgraded, with wood burners, new furnishings, new art work and a high level of care, detailing and personality built in. The owners were present when required and out of the way when not needed, but ready for a chat and advice at any time. Our 3 Irish setters were well provided for with access to good local walking, their own welcome pack and friendly locals. In short, our 2 weeks in Barn Cottage were our best ever holiday and we will be returning as soon as possible! Hi. Thank you for such positive review comments. It is great to know that our renovations and refurbishments have hit the mark. The dogs were great - lovely to see them and we look forward to seeing you all again. Barn cottage is spacious and well equipped with a lovely private garden. The owners Anne and Mike were very welcoming and and helpful. A great place to stay for the week set in a wonderful part of Scotland. Thank you for taking the time to review us. We're pleased you enjoyed your stay with us and liked the cottage. 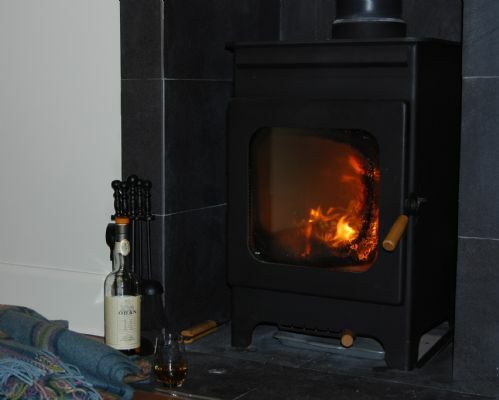 This was our second stay at Loch Seil Cottages (in Rowan Cottage last time), and was, if anything, even better …. although that was greatly helped by excellent weather this year. Barn Cottage is extremely comfortable and roomy, and the wee extras provided by Anne and Mike (especially Anne's home-made shortbread!) showed the level of thought and care that has gone into equipping the cottage. Even the dog was spoiled. We'll definitely be back. Hi, thanks for the positive review comments. We look forward to seeing you back here again! This was our second stay at this cottage, having spent a week there in October 2017. Everything was spot on regarding cleanliness, equipment, great self-contained garden and lovely view of the loch below. The WiFi works really well which doesn't always happen elsewhere. We even got to grips with the log burning fire this time (being townies!) which was great. It was great to see you again, thank you for taking time to review us. Hope to be able to welcome you back again. Barn Cottage was the perfect place for us to stay in for our holiday in Scotland. It is not far from Oban where you can take a ferry over to the Isle of Mull. The area is breath taking with its hills, locks and sea, it's close by is the Isle of Seil, which is very interesting with its history of Slate mining, where there is a very informative visitor centre that explains the history of the island. Barn Cottage is beautifully kept by Ann and Mike, who are always there to help and advise on places to visit. There are welcoming gifts, (even for your dog) which makes you feel right at home from the on set, at the end of the day it's lovely to come back and relax in the comfortable lounge. We do hope to return soon. Our thanks to Ann and Mike. Hi, thank you for your positive comments and for taking the time to review us. Glad you enjoyed your stay, we hope to see you again. Chosen for it’s proximity to Mull, this cottage provided a comfortable location from which to discover the island. We took our two dogs (additional charge) and enjoyed some excellent walks from in the woodland located virtually on our doorstep. The cottage was perfect and provided everything we needed for our mini holiday. Some lovely touches including a small welcome pack with tea/coffee/milk and even some home made shortbread! Really enjoyed ourselves, thank you. Thanks for taking time to give us a review. We're glad you enjoyed your stay with us. We have just returned from a fantastic weekend with the family at Barn Cottage. Mike and Anne were fantastic hosts that made us feel so welcome. There were so many thoughtful touches that exceeded our expectations. The location of the cottage is ideally placed for exploring much of the west coast and it is so peaceful at night time. I can’t remember the last time I could see the stars shining so brightly at night. Our dog Edna had a great time too: she loved snoozing in front of the log burner! Thank you for a wonderful Easter. Hi, thanks for the comments, we are so glad you enjoyed yourselves - including Edna of course! Thank you for your review. We are really glad you and Marley enjoyed your stay! Lovely cottage - amazing views. A lovely, spacious and remote cottage. Just what we were looking for. The welcome basket on arrival, was a really nice touch. Would definitely recommend and we hope to go back. Thanks for the lovely comments, glad you enjoyed your stay and we hope to see you again. Lovely property. Clean comfortable with nice personal touches like the welcome packs... human and canine! 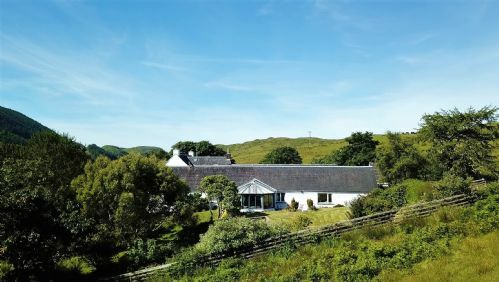 Beautiful and fully equipped holiday home in quiet location just 20 minutes out from Oban. Kind and accomodating hosts with heeps of good tips for a wonderful holiday including places to go see and things to doin the area. The location is ideal to discover the westcoast and the isle of Mull.We felt very comfortable and at home during our stay. Hi, thanks so much for your comments. It was lovely to have you here for 2 weeks and hope to see you both again. October break at Barn Cottage. Lovely cottage in a peaceful setting. Cottage well laid out and well equiped. Lots to do and see in the local area. Would definitely return. Hi Carolyn, thanks for your comments! Hope to see you again some time. We loved this cottage. Everything we could possibly need was provided and the furniture, furnishings and fittings were in excellent condition. The cottage is in a beautiful, scenic area with lots of local wildlife including red squirrels, buzzards, deer etc. The owners, Anne and Mike, were on hand if we needed anything but not intrusive. The Welcome Pack, which included some essentials and home-made shortbread biscuits, was a nice surprise. We will certainly be returning next year as we had a fantastic week full of walks, trips to the Isle of Mull and Easdale and sightseeing, despite wet weather on some days. Thank you for your comments. We're really pleased you enjoyed your stay and we look forward to seeing you again next year! Stayed for a week with family and three small dogs which Anne and Mike kindly let us bring, made to feel very welcome. Lovely location, very peaceful and scenic. Cottage well equipped and cosy with log burner. Short drive to local shops for provisions. Well placed for visiting local attractions and a trip on ferry to Isle of Mull a must, an amazing place with scenery out of this world. All in all a lovely cottage in a stunning location. Thank you for your comments. So glad you all enjoyed your stay in Barn Cottage and your trip to Mull. Lovely place. Very useful to be able to bring the dogs to such a nice place. The garden was worth the extra money and made dealing with the dogs easier. Bed was really comfortable. We even found a lead and mini speaker so we could finish our audible book over breakfast. The owners seem to have thought of everything. A big thank you to them. Thanks for your comments. We're pleased you felt the garden was worth it, having an enclosed fenced garden is always a plus with dogs and that is one of the reasons Barn Cottage is so very popular. We have tried to use our own experiences to anticipate our guests' needs with that extra touch which makes a holiday a bit more of a luxury break. This is the most beautiful cottage we have stayed in during our 45 years of self catering. It is rare that a holiday is perfect but ours was. The owners are such lovely people, there if you need them but respecting holidaymakers privacy which we think is very important. We can't praise Loch Sell cottages enough. Thank you for such lovely comments. We are glad to hear we are getting it right and will strive to keep it so for all our guests. Hope to see you again. The cottage is one of the best we ever had. Sitting on the couch and looking around over the Loch and the surrounding hills - unbeatable. The owner family was very friendly and the welcome package the provided was outstanding. Hi, thank you so much for your lovely comments. We hope you enjoyed the rest of your holiday up North! Beautiful cottage in wonderful surroundings! Just the place to stay and relax, do some walks in the nearby countryside. Perfect! Hi, thanks for your review, we are pleased you enjoyed your stay with us and hope you had a good journey home. Great dog friendly property in a fantastic location for exploring the mainland and islands. The owners have gone to extra lengths to provide a very well equipped cottage and provided lots of little extras that made our stay even better. Thank you for your review, we are really pleased you enjoyed Barn Cottage and your holiday in Argyll. Lovely cottage, ideal location. We had a brilliant week, boat trip to Easdale Island and the seals. Can recommend Gananvan Sands. Thank you for your review. We are pleased you found the location ideal for your holiday and enjoyed yourselves. Beautiful cottage in a peaceful location. A beautiful cottage in a peaceful location. 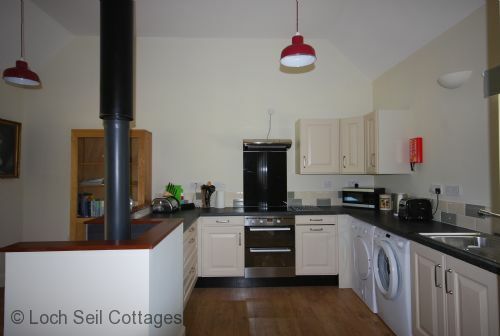 Barn cottage was very clean, comfortable and very well equipped. Ann and Mike the owners were extremely helpful, friendly and provided us with lots of information on the surrounding area. Would definitely recommend Barn cottage to others who like peace and quiet. Thank you for your feedback, much appreciated and we are so glad you enjoyed your stay with us. This cottage had to be the bedt we have ever stayed in, so good thst the next cottage on our route we only stayed 2 nights instead of 3 becsuse Barn cottage had spoilt us do much. It will be hard to choose next time because the standard of the fit out, the comfort, and the location, also we could take our dog, all this will be hard to beat. The owners were very friendly and helpful, also the Barn had a bath, it had shower as well, but we do like a bath. Hi Christine thanks for your comments, we're so pleased you enjoyed Barn Cottage. We do try to spoil our guests, people and dogs alike! We have stayed in many holiday cottages in Scotland over the last 30 years and can safely say that this was the best by far. The standard is better than most hotels and the attention to detail is excellent ( welcome pack , bathroom essentials , local information , and even an emergency telephone as mobile reception is poor ) . It is a beautiful location with plenty of walks and stunning views . It is remote and quiet with plenty of bird and animal life but only about 8 miles from shops and restaurants in Oban. If you love this part of Scotland ( and who could not !) then you will love staying at Loch Seil Cottages. Thank you for such a great review, we always appreciate feedback and thank you for taking the time to review us. Glad you enjoyed your stay. We had a wonderful week, made all the more enjoyable by the extremely high standard of Barn Cottage. We were warmly welcomed by Anne and Mike (and their 3 gorgeous dogs), who gave excellent advice on places to visit, where to spot local wildlife and - especially useful - good dog walking routes. Every detail was just about perfect, from the generous and thoughtful welcome pack to the basket of dog blankets and towels and supply of bathroom essentials in case of any forgotten items. 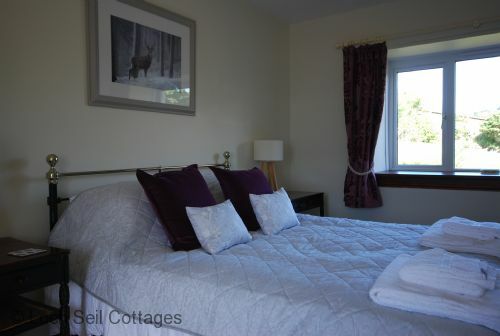 The cottage is beautifully decorated, spacious, comfortable, homely and very well stocked. It was great to have a kitchen containing everything we needed to cook and serve proper meals - no corners cut at all. The peaceful location and lovely garden were very restful and there is so much to see and do within a short distance. Our only regret was only booking one week rather than two! Thanks Kate for your comments, we're really pleased you had such a good time and would love to welcome you back! Fantastic, comfortable cottage. It would have been helpful to know in advance that although doggy friendly they are not allowed in bedrooms and also the fact that during April - June the walks directly from the cottage are not available to due lambing as this did hamper our ability to take an elderly dog for an easy access walk. Thank you for taking time to review us and for your comments. Our Terms and Conditions, which are available on our website and are sent out with every booking, clearly state that dogs are not permitted in the bedrooms. I am sorry that you found the dog walking restricted. The farmer did not restrict access last year and we were unaware that he was likely to do this. However, we did offer the use of our garden, which is nearly 2 acres, as an alternative place to exercise Murphy. We have to comply with the Scottish Outdoor Access code which includes adhering to agricultural restrictions which we cannot always predict. I hope this did not detract from your stay too much. House was lovely and warm with all the things you need for a relaxing holiday. Very well equipped. Had the log burner on once - not cold enough but would be super on a real cold winters night. Both Anne and Mike were very welcoming and friendly. Perhaps one day we will return at a different time of the year when we need to recharge our batteries. Thanks for your kind remarks and taking the time to review us. Myself and my friend wanted a nice relaxing break away from the madness of work and family lives and we got all we wanted was a beautiful calming place to stay. Thanks for taking time to review us, and we're really pleased you had such a good time. We spent a really enjoyable few days at Barn Cottage. 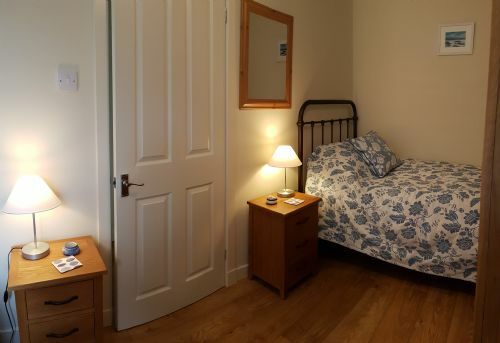 The cottage is very cosy and well equipped, with some really nice welcoming touches. Highly recommended. Thank you for your comments and review, we are pleased you enjoyed your break! I enquired at very short notice about a two night short break for January 2017. Anne couldn't have been more helpful in arranging this for me. We met Mike upon arrival who was also very welcoming and helpful. Barn cottage is simply stunning, beautifully refurbished and equipped to an extremely high standard through out. The open plan layout is lovely and with the wood burner lit , extremely cosy! The little touches make all the difference - milk and eggs in fridge, tea, coffee etc, household items etc. The kitchen appliances are first class and even a slimline dishwasher is included. At the door the little dog hamper is an extremely thoughtful touch , towels blanket and poo bags! Tooth brushes, tooth paste and other toiletries are again an extra i haven't seen provided in many places. The back garden is enclosed and large, perfect for dogs and in the summer i am sure it is just beautiful on a sunny night to sit and relax . I'm so glad i found Loch Seil Cottages when searching for a short break, we didn't want to leave after only two nights but i am sure we will be back for longer later in the year. Thank you so much for your comments, feedback is very much appreciated.